OnePageCRM's powerful update - Quick Quotes has been designed to empower the email body as the main way to send quotes to your prospects. What we have created is something so fast and seamless, it's a powerful tool to help SME's send quotes in a matter of seconds not minutes! 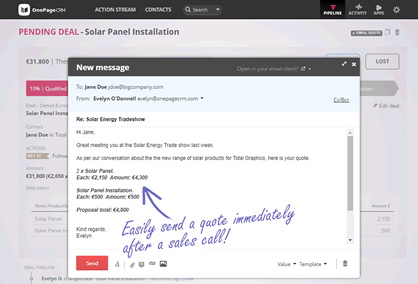 See it in action, Quote to email in 27 seconds! When you look at the proposal / quotation software marketplace, there’s a focus on clunky template builders that create PDFs. The financial data is also added into the complex builder. But in reality, most businesses are using text in the body of an email to send the financial data. This is especially true for deals less than $10,000. Interestingly, many deals above this amount are in the email body too as they are essentially brokered by email and once the final contract is agreed, only then the formal "pdf quote" is created and delivered for final approval. So there’s a disconnect between the marketplace and the workplace (between the makers and the users). We’ve decided to embrace the fact that salespeople both like and want to work with something as fast and flexible as email. We want to give the best experience possible via email, embracing speed and efficiency, over complexity and delays. For the majority of industries, your prospects and customers value speed. There's a saying "Done is better than perfect" (and we're big believers of that in OnePageCRM) - or in this case a quote in your prospect’s hand is better than a late PDF attachment or worse no quote at all. For speed, we believe that the financial figures should be placed in a carefully crafted email template and inserted in the body of the email. Many customers we chat to are overwhelmed with estimates that they often end up cherry-picking some to quote on and miss out on "perceived lower value" jobs / contracts. But the truth is they could be missing out on many contracts from the same customer in the future. Or the referrals smaller customers can give to larger customers. If we have the capacity as a business to produce/create everything we could possibly sell, then it's a shame that the quotation stage turns into the bottleneck! The OnePageCRM quotes system has been designed from the start to empower the email body as the main way to send quotes to your prospects. What we have created is something so fast and seamless, it's a powerful tool in your business. Deal items allows you to add all the products or services of your business, complete with pricing very easily. Then if you have your Email Templates set up correctly, Quick Quotes then grabs that deal info and places it right inside a crafted sales proposal (email template), and in one click it’s sent. This means you can respond to the majority of quote requests in seconds, not minutes!